Ryszard Kapuscinsky is awarded the V Miguel Gil Moreno Prize for Journalism in recognition of his professional journey, “for embodying for fifty years excellence in reporting; being a reference point for world journalism, and especially for war correspondents, as well as an ethical reference for everyone, whether a journalist or not, for his way of approaching others”. Ryszard Kapuscinsky, who received the Principe de Asturias Prize for Humanities and Communication in 2003, was born in Pinsk (now Belarus) in 1932. In 1951 he enrolled in the University of Varsova where he studied History and obtained his masters (1955). Between 1959 and 1981 he dedicated himself to journalism, as a correspondent for a Polish news agency in Africa, Asia and Latin America, and through his contributions to publications such as, Time, The New York Times and Frankfurter Allgemeine Zeitung. Considered one of the best reporters in the world, he is also a member of various editorial boards. Since 1962 he has he has combined his journalistic work with literary activities. He is the author of 19 books of which nearly a million copies have been sold. Some titles have been translated into more than thirty languages. Kapuscinsky was named Doctor Honoris Causa by the University of Silesia in 1977. 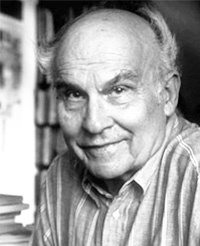 He has deservedly been awarded numerous prizes for his literary creations such as the Alfred Jurzykowsky Prize (New York 1994), the Hansischer Goethe (Hamburg, 1998), and the Imegna (Italy, 2000), amongst others. 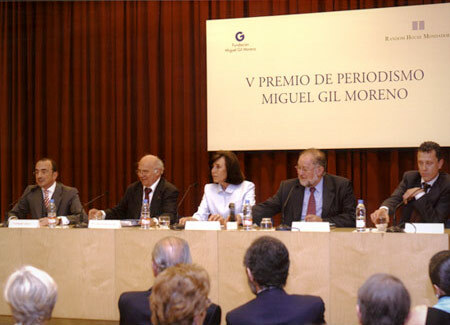 Fernando Quintela, journalist and Jury of V prize, Ryszard Kapuscinski, Patrocinio Macián, President Miguel Gil Moreno Foundation, Fernando González Urbaneja, President FAPE and David Trías, Publisher Plaza & Janés.